Bruckner is a the name of a duo formed by vocalist and performer Didi Bruckmayr (well known for his extreme vocal work with bands like Fuckhead or Wipeout) and electronic musician Bernhard Loibner. They started to collaborate in 2011 and have since performed on various occasions in clubs, concert venues and art institutions all over Austria. The starting point of Bruckner’s performance is the human voice and its use by Didi Bruckmayr. He is looking for a path to the unconscious through the assignment of special vocal techniques. He learned to put himself into a trance, free of fears and compulsions, following his intuitions to sing and act from a state of unconsciousness. An intensification of this practices leads to higher states of transcendence. 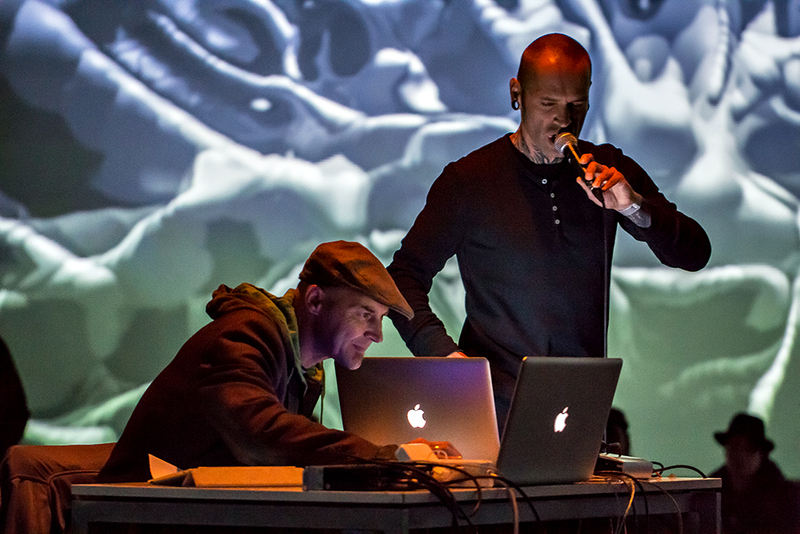 The singer moves through “unconscious landscapes” without a sense of space and time by speaking and singing in weird languages. Bernhard Loibner takes this acoustic raw material and tries to re-contextualize it. Using his electronic instruments the vocals are processed, distorted, slowed down, accelerated, fragmented and destroyed, reassembled. The output of this acoustic particle accelerator serves Bruckmayr as a basis for further vocal activity, which again feeds the computer-controlled “contextualizing engine” — a musical-cybernetic system with an uncertain result. Bruckner demonstrate musical spontaneity and commitment to experimental musical approaches. They evoke associations to archaic scenes of shaman rituals in a synthetic space. Bruckmayr’s ecstatic de-familiarized chants seem like ritual incantations combined with Loibner’s staccato-like machine rhythms and synthetic noise eruptions, which seem to beat the tattoo to a wild dance around a cultish bonfire of a transhumanistic but at the same time ancient culture. The soudscape oscillates between silence and noise, the abstract textures of contemporary classical to bizarre nightmares of early industrial music. A complex mix of sound layers unfolds, taking the lead then suddenly drop and wither away – only to be reborn again in the next moment. In 2015 the Moozak label released their Album Happy End which does implement Bruckner’s sonic universe on a recording medium. The album has had decent reviews and air play in relevant media all over Europe.